Bibian Mentel is the winner of two gold medals for snowboarding in the Olympics. A strong woman, operated nine times for cancer. She had to miss her leg, and underwent seventy-two times radiotherapy. Her mother said to her; if she put a dark face, “I’d rather see your sunny face”. This was not a remark of being merry like, “everything goes well with me”, but more a weapon against the ghosts in her grief. Her husband, Edwin, also her trainer, said, however; “It took me ten years to get through to her, what does she really feel?” With him, she now dares to show her vulnerability. Joshua 1:9, “Haven’t I ordered you, ‘Be strong, be bold’? So don’t be afraid or downhearted, because Adonai your God is with you wherever you go.” (Complete Jewish Bible, David Stern). In this way you make “champions”, heroes and winners. It is a necessity to have this attitude in order to achieve your goal. Her husband, however, is not only her trainer, but also her lover. He desires more than the attitude of inherency, he wanted her heart. She eventually allowed him, so two people became one. What does this line of thought have to do with Pesach? Yeshua showed us extreme vulnerability. He conquered and received more than gold. Dealing with each other in the congregations is too often: “I am strong and I will not be scared”, a bit untouchable. Handy when the enemy is at the door. A child gets so many opportunities from the parents to be vulnerable. If it learns to walk, it may fall over and over again. A good parent does not say: “that is nothing with that walking of you, stop walking”. However, this is not too often the attitude of strong believers. They say: “You can not do that, you have to have more faith.” As a dessert they give you an admonishing text from the Bible. Yeshua says: “He who is healthy does not need the medical doctor, but only those who see that they are sick.” Pesach is a time of soul searching. You must dare to be vulnerable, especially for the Lord. Asaf shouts in Psalms 77, “I cry aloud to G-d, aloud to G-d; and he hears me. On the day of y distress I am seeking Adonai; my hands are lifted up; my tears flow all night without ceasing; my heart refuses comfort. When remembering G-d, I moan; when I ponder, my spirit fails.” (Complete Jewish Bible). 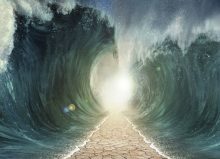 In the same Psalm he saw the water depart, the water of the Red Sea opened up to Him. The enemy of G-d came into a distressing situation. So often just like Israel had come in a distressing situation. The enemy chases you and calls; “You have to dare, you have to be able to, ha, ha! The enemy of Israel went down into the sea, while G-d made a way out for the vulnerable people, but the water closed above the “strong ones”. An honest and vulnerable Passover!